Some people say that the Miss Dior Bag is the only bag that can match to the fame of the Chanel Classic Flap Bag. And taking account of the incredible detailed craftsmanship (I mean, notice the stitches and the refined lines) in combination with the use of carefully selected leathers (and they are from the finest and thus expensive), we can agree with the statement. If the Chanel Classic Flap Bag in medium size is equal to the Miss Dior Bag in normal size, then theJumbo Classic Flap Bag can be matched to the Miss Dior Bag in large size. For those who are interested about its age, it was first released in the Fall 2014 Collection and Jennifer Lawrence has already been featured three times in their ad campaign holding the latest edition of these fine accessories. According to Raf Simmons, her classic beauty is the perfect attraction needed to represent the newest Miss Dior Large Bag. The difference between the Medium Classic Flap Bag and the Jumbo Classic Flap Bag is only the size, the appearance doesn’t differ much. It’s not your fault if you can’t decide between the medium and the jumbo because they both look very much alike. But you can spot the difference between the Miss Dior mediumand the large bag in one glance; the large size has an entirely different shape. It’s more curved. The round shape is needed to open up extra spaces, so you can drop more essentials; one bag that can take everything you need from day to night, how great is that? And the Miss Dior Large Bag doesn’t lack anything; the tradition is still there like the iconic Cannage Stitching, the curved lines and the elegant DIOR closure. DIOR released for the Spring Summer 2014 Collection two new editions for the Miss Dior Line. The first one is in ‘black and white printed ayers’, an exotic zebra style embellished with fine silver hardware. The second bag (also featured on the latest ad campaign), is the Miss Dior Large Bag in Hand-Painted Python, it’s the highest level of luxury pleasure. 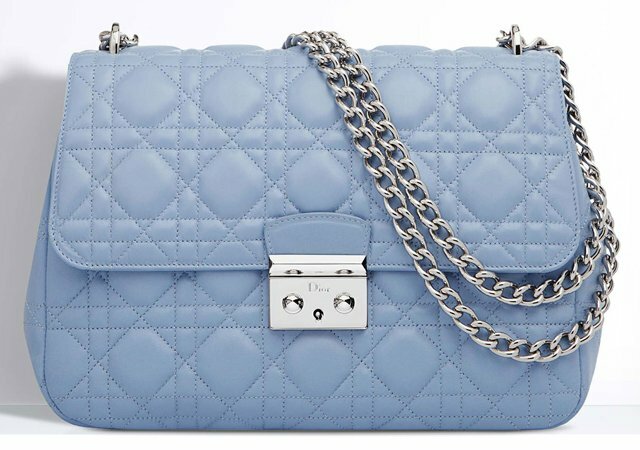 The Miss Dior Large Bag is sized 25 x 18 x 10 in cm, the lambskin leathers are retailing for $4,100 USD.